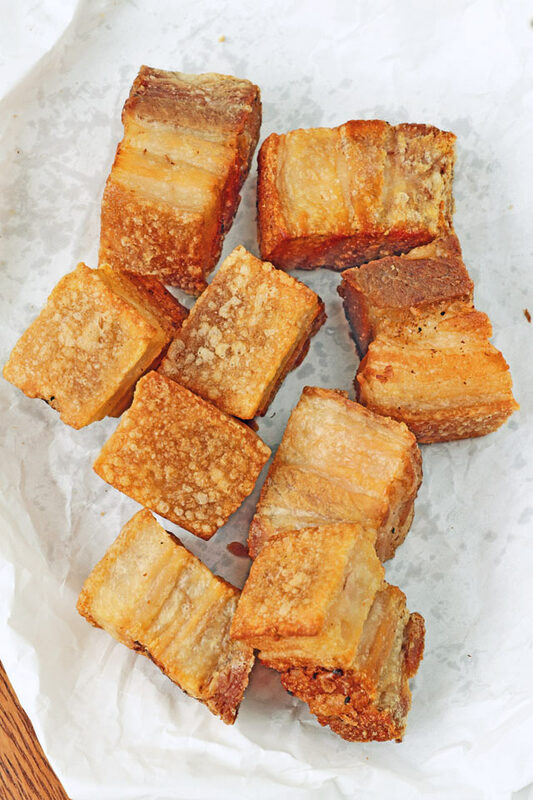 Learn the secret on how to make crispy Lechon Kawali, an all-time Filipino favorite dish of pork belly fried to a perfect crisp! Deliciously crunchy in every bite! Lechon Kawali is a well-loved pork dish all over the country and probably soon, all over the world. It involves boiling the pork belly slab and then deep-fried later on, making the exterior crisp and crunchy while leaving the inside tender and juicy. I can never tire of eating Lechon Kawali and I could probably do so every day, if only it is as healthy as it tastes (really) good. But indulging once in a while should be fine. In this post, I will also share a secret on how to get that pork skin crackling to a perfect crisp. 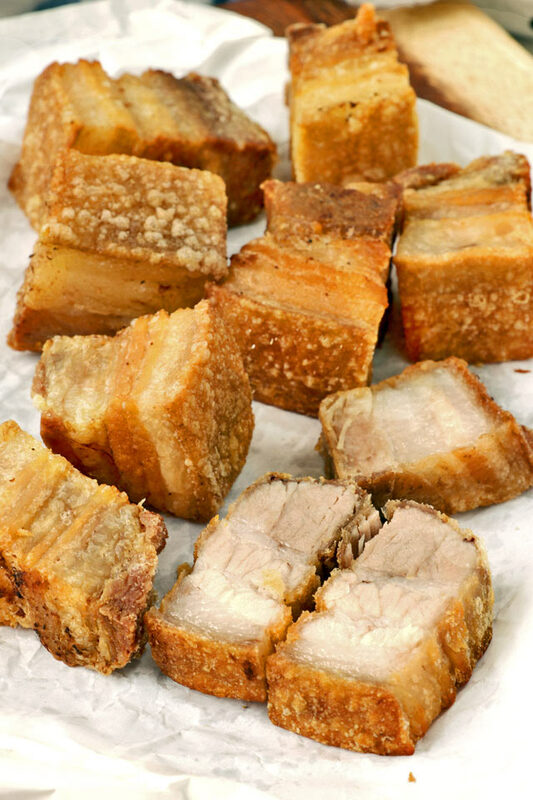 But first, here are some tips on how to choose your pork for Lechon Kawali. what is the best pork cut for Lechon Kawali? 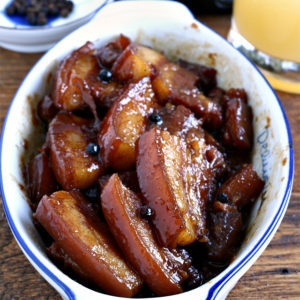 The cut that is used for making Lechon Kawali would be the ‘Liempo’ or the pork belly. 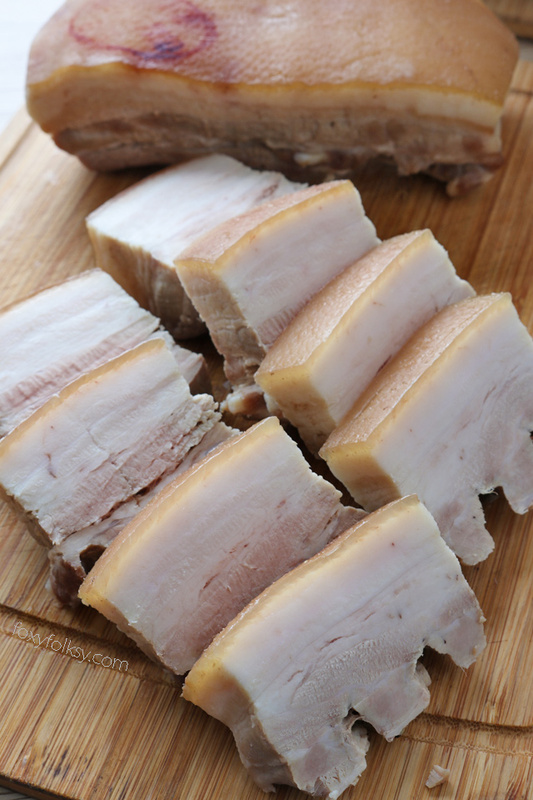 The interchanging layers of meat and fat make it one of the tastiest part of the pork. 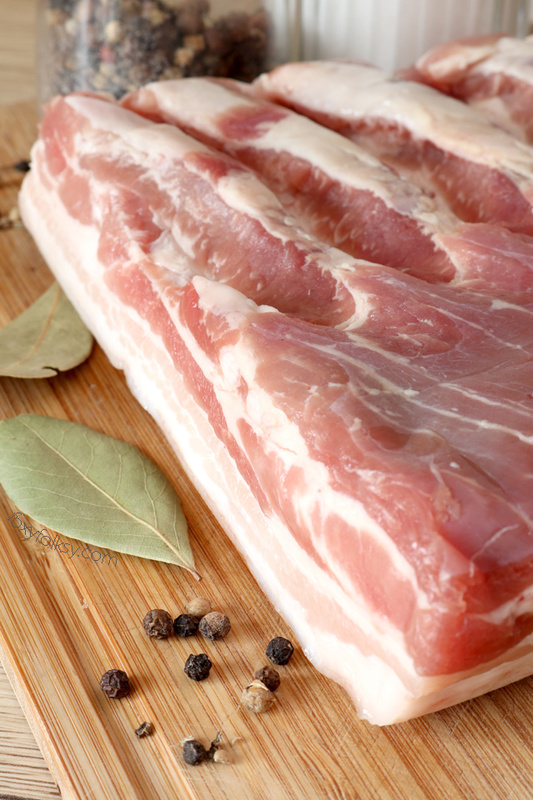 Choose a slab of pork belly with equal parts of fats and meat with good alternating layers. Too much (lean) meat will give you dry, hard and chewy texture so do not get a thick slab. Choose a pork belly slab that is not more than 1 1/2 inch thick. how to make crispy fried pork (Lechon Kawali)? You’ve got to air dry your pork first after boiling it. You do this by draining the excess water and then putting the slab of pork belly in the fridge for some hours or overnight. After the pork belly is air-dried and ready to cook, cut it into desired frying pieces. I find that cutting them into squares the size of an inch is the most ideal size. This makes all sides golden and crispy while the interior remains moist and juicy. This also reduces the cooking time. While frying, you have to sprinkle a bit of cold water from time to time to induce the crackling of the pork skin. Just be careful of the splatters and I would suggest to cover up your hand and arms (and face) if possible or get a splatter screen like this one. Lechon Kawali is usually served with spicy vinegar or a special liver-based Lechon sauce but my favorite dip is a mixture of soy sauce and vinegar with lots of chopped onions and a red hot chili with some fresh ground black pepper. Another serving of rice? Yes, please! 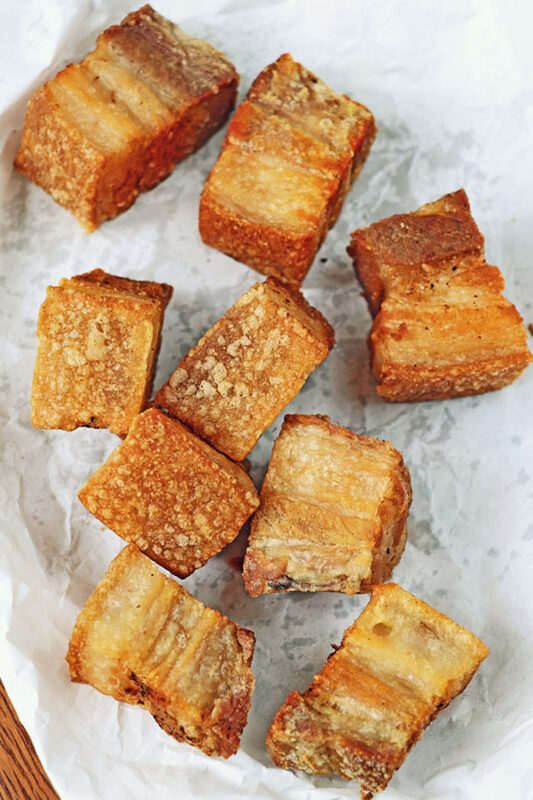 Get this recipe now for this all-time Filipino favorite dish, Lechon Kawali, pork belly chunks fried to perfection! 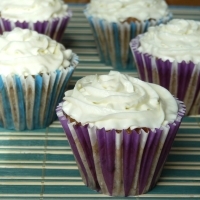 Deliciously crunchy in every bite! 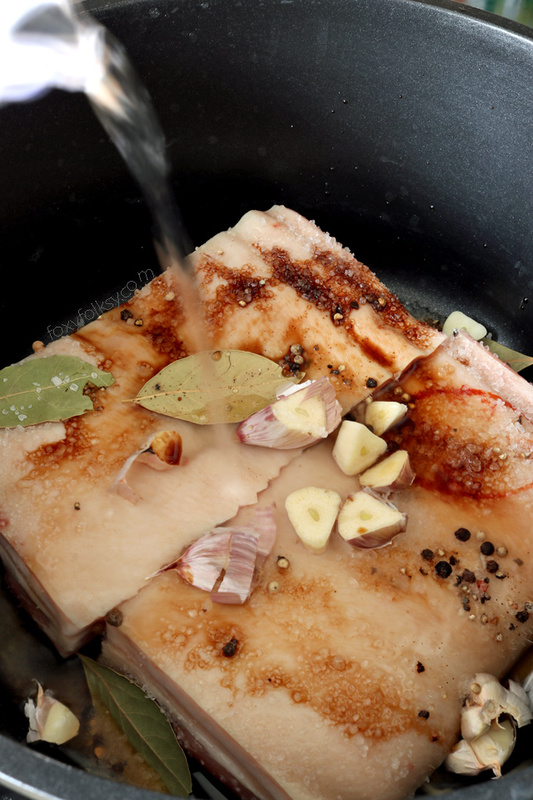 In a pot, combine pork belly, salt, peppercorn, bay leaves, soy sauce, garlic, and water. Bring to boil. Let it cook until meat is fork-tender. Remove the pork belly from water and let the excess water completely drain. Transfer to a plate and then rub 1 tablespoon of salt all over the meat. Put in the fridge overnight to dry out. Cut in cubes, about an inch thick. Heat oil in a wok or pot over medium-high heat. Once the oil is hot, fry each side of a cut for 5 minutes while sprinkling the skin with ice-cold water and letting it crackle from time to time. Remove from hot oil and transfer into a plate lined with kitchen paper towel to remove excess oil. Serve while still hot with your fave dipping sauce! 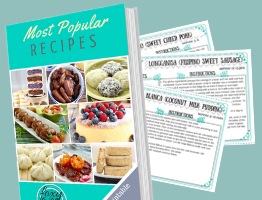 Do you have a recipe for Chicharon? I’m guessing it will be a lot like this one. Thanks! Hi Jessica, I do not have a chicharon recipe! But as far as I know, after air-drying them in the fridge you still have to either bake them under the heat of the sun or in an oven before you deep fry them. I love Lechon kawali but i’m so afraid to cook it. Tried once and it took me hours, because i turn off the fire once in a while everytime i turn the meat. 😉 just to be safe from oil splatter. thanks for sharing nakakagutom 🙂 . Natry ko n po Yung sprite/7up SA marinade at masarap Lalo n pag overnight. This is so good. I Lechon Kawali in my blog too, and I cannot get enough of it. I wish it’s healthy so that I can have it everyday. Also, you guys moved back to the Philippines? That is a brave decision to make. Good luck! Wow! 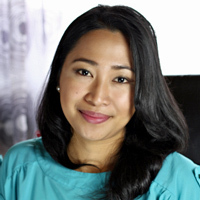 What a surprise to know that you moved to Philippines… for good? Anyway, I like to try this but I was thinking how to do exactly sprinkling water while frying? The oil probably would be splashing…. hehehe a little afraid of it…. Hi Jueven, yup we are here and hopefully for good! I know exactly what you mean by being a little afraid of the oil splatters…me too! Just be careful and keep some distance and it should be fine.